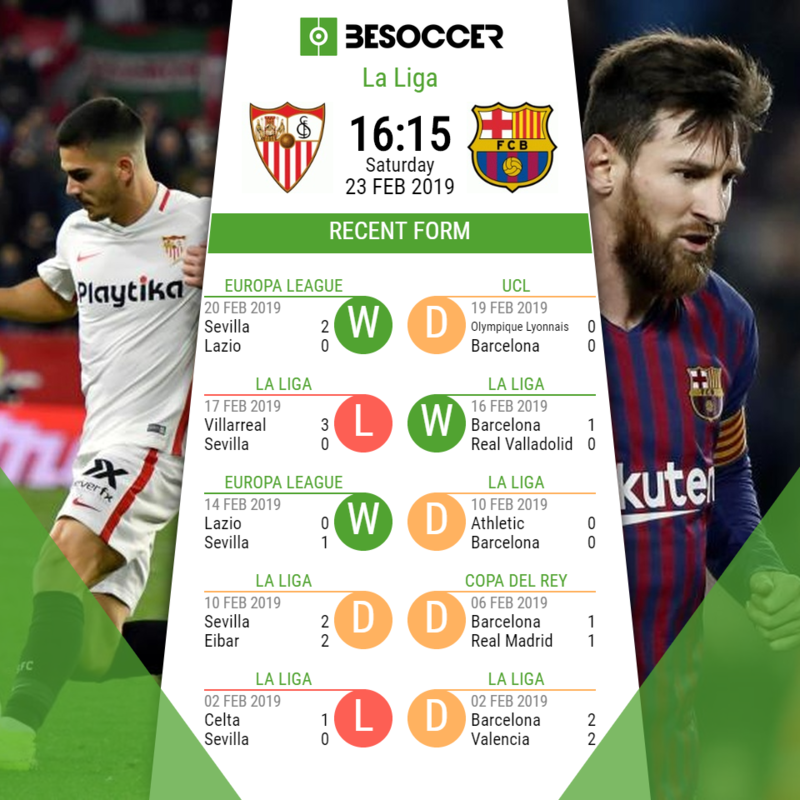 We look ahead to the La Liga clash between Sevilla and Barcelona from the Estadio Ramón. Barcelona are looking to put an end to a poor run of form in which they have won just once in their past five matches in all competitions. Adrien Silva and Wissam Ben Yedder should start together in attack, while Gabriel Mercado and Sergio Escudero impressed against Lazio and should keep their spots. Munir El Haddadi will probably start on the bench against his former club. Roque Mesa is suspended and will not feature, while Nolito and Aleix Vidal will miss out once again with injury. Samuel Umtiti could be in line for his first La Liga start since November 24 after recovering from a long-term knee injury. Arturo Vidal should return in central midfield, while Philippe Coutinho will likely find himself on the bench again due to Ousmane Dembele's return to full fitness. Luis Suarez should keep his place in the team despite a run of five matches without a goal, while Semedo and Jordi Alba are in line to remain as the side's full backs. Jasper Cillessen, Arthur, Thomas Vermaelen and Rafinha are all long-term absentees and will not feature. "He [Messi] is the best in the world and we have to realise that, that's obvious, but their team is very strong as well. Barcelona scored five against Real Madrid without Messi. He is important but the collective is even more so." "Other than the injured players we already had, Navas is the biggest doubt, we have to see how he progresses. These 24 hours are important to see how the player is, how he feels and from there make a decision." "I don't know what to tell you. Sometimes results mean something as there are difficulties but it depends how you play. You might not win as you don't create chances, or you might dominate and not take your chances. Against Lyon we were creating chances but didn't convert them into goals." "We think that Umtiti’s ready to start. Vermaelen is out injured, Lenglet has a yellow to go to complete the cycle. We all know the ability Sam has. The situation is what it is and we will see what day it is when he plays." The two sides drew 2-2 in their last league clash at the Estadio Ramón. Sevilla have earned only four points in their last six league matches. With 81 wins, Barcelona have defeated Sevilla in La Liga more than any other team. Sevilla: Vaclik; Gomez, Kjaer, Mercado; Navas, Sarabia, Banega, Vazquez, Escudero; A Silva, Ben Yedder. Barcelona: Ter Stegen; Semedo, Umtiti, Pique, Alba; Vidal, Busquets, Rakitic; Dembele, L Suarez, Messi.